It’s no small thing to say that the reaction to Windows Live Messenger 2009 and related clients that use the older Messenger protocol has been pretty intense. Regardless if you’re using Windows XP, you have a favourite feature that’s missing in the 2012 version, or you simply do not want to use Skype, it seems everyone is looking for another option to choose from. 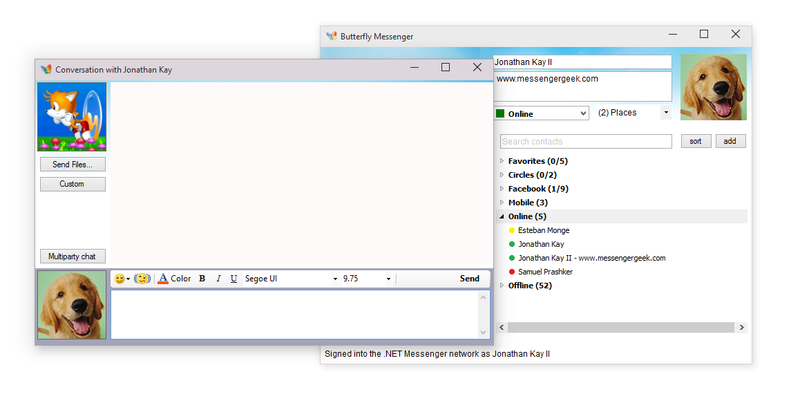 Butterfly Messenger is an improved working version of the client used to demonstrate MSNPSharp. It supports the same protocol version as Windows Live Messenger 2012 (MSNP21), and has the a basic Messenger feature set. The current release is an alpha version of Butterfly Messenger intended to be used to collect feedback on bugs, features and other changes. However, it is relatively stable and usable. Butterfly Messenger currently requires Windows XP or above with at least the .NET Framework 2.0 or above installed. Although MSNPSharp was deliberately written to support Mono (on other platforms), the client presently does not run on Mono (but probably works on WINE), hopefully this will be addressed later for Linux and/or OS X compatibility. You can now download the third alpha release of Butterfly Messenger. Due to the early nature of the project, it does not presently have an installer and you will need to extract the files to a folder of your choice and run it from there. Butterfly Messenger makes use of the Segoe UI font (like Messenger). If you do not have the Segoe UI font installed right now, you can install it from the Messenger 2009 files. Please feel free to leave quick comments here on this post, but if you wish to go in depth, you can make use of the Butterfly Messenger category on the forum. Depending on the situation, brand new conversation windows may blink even if they’re in focus. If you start typing a reply, they should stop blinking. Flickering in the contact list. Custom emoticons will appear, but the current conversation window does not support animated GIFs. Animated GIF display pictures work though. Butterfly Messenger is open source software and based on the MSNPSharp project code. A repository will be set up shortly once more details about the project have been finalized. I’m sorry to report that this Thursday’s update ends the last bit of trickery for any clients prior to Windows Live Messenger 2012 (MSN Protocol Version 21). You can see this for yourself using dx’s server list on www.ismsndeadyet.com. On Thursday, February 26th, most of the servers removed MSNP18 support, but left a few bn1 servers allowing the old version and all db3 servers. On Thursday, March 5th, the last of the bn1 servers removed MSNP18 support, leaving only db3 servers. On Thursday, March 12th, the last of the db3 servers removed MSNP18 support. If you’re using Windows 7, Windows 8 or Windows 10, and wish to continue using Messenger on its own, you will need to upgrade to Windows Live Messenger 2012. You can do so by downloading and running Reviver again, clicking the Advanced button, selecting “Do a new Messenger install” and choosing Windows Live Messenger 2012. If you’re using Windows Vista, despite being unsupported officially, with a workaround you can install Windows Live Messenger 2012 too. I’ll be detailing this process shortly. If you’re using Windows XP, Mac OS X, Linux, or any other non-Microsoft Messenger client (as of this writing, none I’m aware of support MSN Protocol 21), you will need to either use Skype or the web-based client in Outlook.com. My efforts on bridging an interface between the newer and older protocol wasn’t terribly successful so far. You can always use Messenger 2009 or other clients if they’re made to work again. This is the end of an era. Messenger Reviver 2 supported these older clients (including the popular 2009 version) from April 23 2013 to March 12 2015, they will be missed. If you’ve been relying on the workaround from last week for versions of Messenger prior to 2012, beginning just a few minutes ago, a number of the Messenger servers disappeared and sign-ins on these prior versions are once again failing with error code 80072efd (which means, can’t connect). Another workaround I was trying this week has not been successful, so you’ll have to upgrade to 2012, use the web-based Messenger version on Outlook.com or upgrade to Skype. To upgrade to 2012 on Windows 7, launch Messenger Reviver 2, choose the Advanced button, then select Do a new Messenger install, and then choose Windows Live Messenger 2012. If you’re using Windows Vista, version 2011 will not presently allow you to sign in, but this should be fixable eventually as it uses the same version of the protocol as 2012. If you’re using Windows XP, you will need to use Outlook.com or upgrade to Skype for now. A small number of users using pre-2012 versions are redirected into the “db3” servers, which revived clients will now automatically try. With this in mind, if you are one of the lucky ones with an account that operates in this way, you may till be able to sign in or have contacts that do using these old versions. Note: conversations on 2012 are sporadic right now, I’m going to assume once the current server changes are completed, it will go back to normal.